The second online competition as per my plan was to conduct a Situation Reaction Test. But due to the overwhelming response I received for the TAT/PPDT I have decided to carryout another TAT online competition. All participants will be required to write a story based on the picture that is displayed down below. You must write the story in 12-15 lines (A4 size). Try to write the story within 4 mins. And do not look into the picture for more than 30 seconds. You are required to write the story in the comment part of this article and your story will be reviewed and I will put my comments so as to help you improve upon your shortcomings. AND TO MAINTAIN THE COMPETITIVE SPIRIT,THE BEST STORY WILL GET A FREE ENROLLMENT TO MY ONLINE TUTORIAL COURSE AND WILL GET COURSE MATERIALS FOR SSB INTERVIEW WHICH ALSO INCLUDES 3 SETS OF MOST REPEATED PSYCHOLOGICAL TESTS QUESTION BANK PREPARED BY ME!!! THE RESULTS OF THIS WILL BE POSTED ON 30 MAR 12………I URGE YOU TO WRITE THE STORIES AFTER GOING THROUGH THE PREVIOUS ARTICLE AND THE STORIES WRITTEN AND MY COMMENTS ON THEM. MY ENDEAVOUR IS TO MAKE YOU LEARN FROM OTHER’S MISTAKE. SO BY READING OTHER’S STORY AND MY COMMENTS ON THEIR STORY WILL HELP YOU LEARN THE CORRECT THING TO BE FOLLOWED. I ALSO REQUEST YOU TO WAIT PATIENTLY FOR MY REPLIES AS IT TAKES TIME TO EVALUATE ALL THE STORIES. IT WILL TAKE AN AVERAGE TIME OF 4 TO 5 DAYS FOR ME TO EVALUATE YOUR STORY AND PUT UP THE COMMENTS. Ashwati , a 12th standard student from venkat international public school had her practical exam on 10 february . Her teacher Mr M Reddy was keenly looking at the way she was performing the confirmatory test for the inorganic salts . He was impressed by her and wanted to help her to get 100 marks in the exam . So he asked her for any help but she refused any help as it was an exam and she was confident to analyse the salt . She then finished with the titration process and had completed her exam . Aqthar, I can make out that your knowledge of inorganic chemistry is good, but that is not what we want here. Though the story is ok, it needs to fulfill a better and higher theme/goal of the heroine. An average story!! Asif 22 years,Msc(chemistry) student in DAV college Ratlam.One day when he was in lab for practical class with his classmates & both chemistry teachers.Then he sensed a burning smell.he observed a electric wire line was smoking.He immediately ran to switch off the main switch.At the same time he told his friends to put off all gas burners as well as told them to left the lab.He called electrician & got repair the wires.After ensuring everything was under control ,he requested his both teacher to restart their practical class. Dear Sunil, donot get demotivated by my comment but try to understand your mistakes and shortcomings…we all assumed it was a girl, but how did she look like a ‘HE’ to you?? Anyways assuming that the picture clarity was bad, Sunil your english standard needs definite improvement. Let me point out all your mistakes one by one. 1. first sentence – with his classmates and both chemistry teachers: DOES THIS MEAN THERE WERE TWO CHEMISTRY TEACHERS OR BOTH MEANS CLASSMATES AND CHEMISTRY TEACHER???? 2. Why did you use the word ‘THEN’ in the starting of a sentence here??? 6. Correct:He called the electrician and got the wires repaired. got is past tense and repair is present tense you cannot use both in a single sentence!!! Pranati was always a bright student beginning from her childhood.She had the aspiration to use her skills in research so that she can contribute something new to the country.As she was good in Chemistry,she completed her PHD in chemitry with an additional diploma degree in Pharmaceutical Science and now she has joined Cipla,a huge pharmaceutical firm in the market. She has a team of five people with her and they were researching on the development of a new medicine.However,they failed many times.But it didn’t discourage Pranati.She worked hard on it and completed all the tests successfully.The whole team as well as the firm is very proud of her and they have launched the medicine in the market also which gives fruitful results and helped the people a lot. Sourav, a nice story well written!! Asha was pursuing her M. Pharma from a private college. she used to devote long hours in lab. one day while she was carrying a experiment, her teacher sandhya came and was surprised to see her at that time. she enquired about her presence there even after the lab has been closed. Asha explains that she is trying to find a new cheaper drug for cancer as the drugs available in market are very expensive and poor people can’t afford them. asha tell her that due to the same reason she lost her mother. After learning about asha’s aim, sandhya decided to help her and gives her suggestion that what compounds she can use to prepare the low cost drugs. after getting this help. asha worked hard was finally able to invent such a drug which was cheaper and easily available to poors. Aarti was a bright student from an average background who was doing her Phd. in Chemical Sciences.She was very hardworking and dedicated and used to work late in her lab till night.After months of labor and toil she was finally able to invent a chemical that could be used for the treatment of a dreaded disease of human kind .She immediately called her guide and showed her work who was very much amused and glad at her.This helped her win the blessings of many people,win various prizes in her field and also made her parents proud. Thanks sir , i would correct my mistakes and will come back with a better storyline . Sir,i don`t demotivated from your comments,even your comments make me more strong as i work out on my mistakes. 1.As a male candidates i did n`t take a female heroine,my hero was hidden(can we project),both a male & a female characters shown in picture are chemistry teachers in my story. 2.how was my theme ? thanks for comments,i will not commit such mistakes in future. Dear Sunil, as always your theme is good.I suggest you dont use this concept of Hero only attitude. Be flexible and let your stories cover a wide spectrum. Ram,22 years old was working in a laboratory with his fellow classmates as a part of their Chemistry assingment.While everyone was busy working with their respective experiments, suddenly a fire broke out in lab due to some mishandled chemical reaction.Ram with his 4-5 friends quickly evacuated everyone safely from the laboratory and ask one of his friend to inform the lab authorities and call for help.Till help arrives Ram with the help of fire extinguisher tried to control the fire.After few hours of endevaour fire got extinguished and injured students got the medical aid.Ram for his bravery was awarded bravery award in their college annual function. Anuj, a nice concept. The story is good. Need some improvement in your language style. An above average effort. my central character is of 32 years Dr.radha.She is hard working and intelligent which led her childhood dream to become a doctor. Now she is appointed as assistant health physican in rural area of orissa.Where she recently came across that people suffering from WATER brone diseases,so she takes water samples from different places with help Dr. ISHANT SHARMA.WITH POSITIVE SAMPLES she prepared a report for the concern state authority and demanded recent action. AUTHORITY take immediate action and avail peoples with medication and supply of fresh water.In this diseases go down effectively. Amar was a chemical graduate student in university of hyderabad.he once came to know about lossage faced by fishing industry due to corrosion of metal. he decided to develop a paint that makes metal free from rust.he collected various types of paints and analyzed their chemical properties.he also studied the corrosive action of metals mainly iron.By his innovative thought and hard work he developed a paint that prevents rusting of iron with help of his professor. his work was able to help many people of nation in various sectors. Thank You Kumar Sir…I want to know if there is any mistake so that I can improve myself…suggest me. Dr. D’souza, a renowned analytical chemist always prides herself in teaching her students the right approach, methodology and attitude to approach experimental science. Having taught chemistry for over two decades, she learnt to observe and evaluate students very quickly. During one of her evaluation sessions as an external examiner, she came across an unusual student. This students approach to a routine experiment was extremely original and innovative. Impressed with the way she was carrying out the experiment, she continued to observe her from a distance. Intrigued by her, she approached her to inquire about her background in the subject. On conversing with her, she was surprised to learn that the student was not only self taught but had done so while working in a publishing center. She was immediately reminded of Michael Faraday who had a similar story. Recognizing her innate genius, she then proceeded to give the student her address and asked her to get in touch with her should she need any assistance from her. Dear Bharadwaj, a very good story. So far the best !! Richa working as Sr. scientific in ranbaxy lab. few day back she was working on a new bacterial stain. After 10 day she observed some excellent result in that stain and when closely observed the stain it was treatment for H1N1 virus. Ravi Sr. manager of richa represent the report to higher management. As a result of her hard work she promoted for best employ of the year and this new bacterial stain nominate for award. Juby, what is the meaning of Sr. scientific???? is it scientist ??? correct your mistake: best employee of the year!!! Shobha was an intelligent, self-reliant and a hardworking research scholar, pursuing her doctorate in a renowned pharmaceutical institute. She was blessed with an excellent guide, a world renown pharmacist and a noble laureate. One late night, she was working in the lab as per her routine. Her guide who was passing by, saw her and was impressed by the interest and determination exhibited by his research scholar. He went to her and conveyed his appreciation, enlightened her with his motivational words and a few experiences of his own research days. Shobha was awestruck by the simple and down-to-earth nature exhibited by a man of that stature. With renewed zeal and enthusiasm, she completed her PhD and was conferred upon many awards for her work. This made her more humble and she continued revere her guide all through her successful life. That one night remained the night of her life. Srikanth, an average story. What is great about this story. These days everyone works late night. Is working late night is something great?? Abhay, plz upload it again!!! Gita,the very talented and dedicated student of Delhi Public School was carrying her practical test on Chemistry.Though she tried a lot for the titration but it was not properly executed by her and she seemed to be very upset.Finding this her Chemistry teacher insisted her to carry the experiment once more before her and assisted that this time she will be successful.Gita did the titration once more and this time at her surprise the experiment was perfect.Thus Gita could understand that success lies in ones deed and she was extremely greatly to her teacher for this. Tasmin Banu, it is a good story. It is relevant to the picture. It is conveying a meaning. A good story. you must try to add some more meaning to it if possible. Malika,a bio-medical student who was very poor but she was very talented and helpful in nature.Her father is a cancer patient who has been suffering for several years.To recover his father and people who are suffering from cancer,she had started her research on to prevent cancer and to cure it in the intial stage.She tried hard on her research,her Prof.Devi helped and encouraged her consistently on her research.Malika worked hard on her research for several months.At last she found a immune medicine which can prevent cancer in the intial stage.She served her father with the medicine but it doesn’t cure his cancer though he wasn’t on an intial stage of cancer.He was very proud of his daughter for her research and after a month he died.To the success of her research she received many awards and schlorships.She successfully completed her master degree in research with the help of schlorship.And her future plan is to open a new cancer treatment center to treat cancer patients with free of cost. Srijith, an average story. lots of grammatical mistakes, like his/her misplaced at some places. Jai Singh, please come to a conclusion as to whether it is he or she!!!! you have mentioned at some places as he and at some places as she!!!! plz dont do such unacceptable mistakes!! SHE STARTED HER RESEARCH IN THE PRESENCE OF HER GUIDE.PRIMARILY SHE GOT BITTER RESULTS.SHE CONTINUED HER EFFORTS TOWARDS THE RESEARCH .FINALLY SHE SUCCEEDED IN HER RESEARCH AND BECAME SENIOR SCIENTIST.SHE WAS HAPPY WITH HER SUCCESS . actually i am using mobile net service that’s why i make this mistake. pankaj is a doctor in AIIMS delhi.he is the youngest doctor who is appointed for the research wing. he was working on a project of curing diseases by the stem cell treatment.so that he first analyze the situation and made a plan by divide his team into small groups with separate works.simultaneously working along with each team he did experiments on animals first and after that he successfully implemented this on the humans.so after that cure of many diseases are possible by his vision. Thank you sir.I will concentrate more on grammar parts. Vishal was a boy belonging to a poor family .From his childhood he was very intelligent and well disciplined boy . He had zeal to learn new things .After completing his Xiith with good marks .He had applied for IIST exam and got selected .As a scholar he choosed chemical engineering branch. one day he came to know through news paper that there are still many villages in our country having no electricity supply and nuclear electricity is also very less .so he started researching for making artificial uranium in laboratory with his friends so that it can be used for making electricity .He faced many difficulties but he faced all those calmly and patiently .one day his dream come true .He was awarded Bhart Ratna award .Being a kind hearted man he donated all the prize money for charity .He was satisfied and happy for doing something for our country. sir what should i tell when asked that what is the difference between your name and your parents name. Abhay, just tell tham what ever the difference might be!! Permanent commission is for a minimum of 20 years and a maximum of 54 to 63 ranging based on what rank you are in!! Short Service Commission is for a minimum of 10 years and a maximum of 14 years. PC get pension , but SSC donot get pension. if your hobby is yoga what can you implemented new in this, please suggest. Sangeeta was a brilliant student since childhood. After completing her Masters in Microbiology, she wanted to go into research and thus opted for Phd program offered by university of Gujarat. She was aware of the fact that the due to the various oil industries in Gujarat, environment was getting badly affected. And one of the major cause was the oil spills from the factories. This was causing water pollution, air pollution due to evaporation and also making soil less fertile. She took up the challenge and thought of making chemical product that would help curbing this problem. After thorough analysis , hard work , dedication and help from her professor she was able to make a product that would remove the oily sludge/oil contaminated soil. She presented this product to the environment department and after required testing this product was approved for the use by the oil companies and farmers. Sangeeta felt really happy and satisfied with her effort. She continued research to further enhance this project on bio remedifiacation. Rajit, a very good story. Good !! sir if there is a gap in the study e.g.i have taken the IIT coaching but not got selected should i tell this to the board or any other reason should i tell k SIR THERE IS ONE MORE PROBLEM IS THAT PREVIOUSLY I HAVE LEAVE THE ssb DUE TO iit EXAM ALSO SO THERE IS ONE MORE QUESTION I EXPECTED IS THAT WHY YOU LEAVE THE PREVIOUS SSB SHOULD I TELL THE TRUTH OR ANY OTHERE REASON PLEASE SUGGEST ME LIKE YOUR YOUNGER BROTHER . Siddesh, good story. but a bit too small. try to increse 1 or 2 lines. dr. ammer assist professor of national research istitute was appointed as the head for research against hiv virus… he made the team of best scientists.. divided them into two, one team consulted the affectd persons and colleted the requied data.. others reffered the available research results and other publications.. all met together gave there results now they carried on various tests on hiv virus and noted the results, tested at various temperature and atmospheric condition. they were able to preare a antigene which can be used against hiv virus, tested it on monkey and then on a affected person using all precautions, got good results. submitted their report and was appreciated.. he was happy and carry on with further reseach..
Dear Hitesh, your sentences are all broken. Overall an average story. There was a boy named Sumit who studied in tenth class. Since his parents didn’t had enough money for the tutions he dedicated all his potential to the school lectures. he got great marks in tenth class but due to poverty his parents didn’t allowed him to study further. So he went to the school and listned the lectures from outside the class. Once the principal on round saw him and his dedication to chemistry. He talked to all the teachers and gave him scholarship. later he second at national level in science. There was a boy named Sumit who studied in tenth class. Since his parents didn’t had enough money for the tutions he dedicated all his potential to the school lectures. He got great marks in tenth class but due to poverty his parents didn’t allowed him to study further. So he went to the school and listned to all the lectures and saw all the practicals from outside the class. Once the principal on round saw him and his dedication to chemistry. He talked to all the teachers and gave him scholarship. Later he worked hard and came second at national level in science. PRIYA WAS A STUDENT STUDYING IN 6TH CLASS AND VILLAGE PEOPLE WERE SUFFERING FROM A DREADFUL DISEASE .SHE WAS VERY CONCERNED ABOUT THE PROBLEM SHE THOUGHT OF GETTING RID OF THE DREADFUL DISEASE AND SHE COMPLETED HER MBBS AND FOUND A REMEDY FOR THE DISEASE AND EXCELED IN THE FIELD…..SHE VISITED HER VILLAGE AND OPENED A HOSPITAL THERE AND SERVED PEOPLE WHOLE HEARTEDLY……..LATER ON THE CONDITION WAS IMPROVING AND SHE WAS APPRECIATED FOR HER WORK. There was a girl named Sumita who studied in tenth class. Since her parents didn’t had enough money for the tutions she dedicated all his potential to the school lectures. She got great marks in tenth class but due to poverty her parents didn’t allowed her to study further. So she went to the school and listned the lectures and saw practicals from outside the class. Once the principal on round saw her and her dedication to chemistry. He talked to all the teachers and gave her scholarship. Later she scored second position at national level in science. Abhimanyu, a final year student of S.C.B Medical College is very sincere in his studies and he is also very much determined to find out proper medicinal combination of a desease that caused her little sister to die in a very early age. Every day after his class get over , he comes to lab and keep on with his research work. Mrs. Jagrata, his bio chemical professor is very much confident and co-operative to help him out and even to motivate him. After a long time hard work and perseverence he has found out some kind of solution for the deadly desease and Mrs. Jgrata is feeling very much proud about his achievement after getting the confirmation of the new invention and she also promises to send this project nto central medical research centre for its further modification. Abhimanyu is very much happy, as he would be able to save a lot many life that would have got destryod by the desease. Sir, [please tell me how is my story and i had also posted another story yesterday only but dont know that story is not here as i am seeing for it today. sir, please help me out by giving some comments and advices so that i would be able to get a bit of things about what i have and what i lack. thank you sir. Marie Curie is a well known physicist and chemist and famous for her pioneering research in radioactivity.She met Pierre curie who was the instructor in school of physics and chemistry. They both got married and Marie Curie continued her researches and her husband who was also a scientist supported her.Through her sincerity and love for her research she was able to find the technique of isolating radioactive isotopes.She shared the Nobel prize with her husband Pierre curie.She even founded the Curie Institutes in Paris , which remain major centres of medical research today. Thus Marie curie is a role model for aspiring women and Pierre sets an example for men to support their wives and their goal. Dr.Samita completed her Ph.D in Chemistry and Pharmaceutical research from B.H.U,Varansi.While her college days during an experiment she found some amazing characteristics of Mercury and its group elements.She decided to build her career in the field of Research and development.She qualified “SET” and joined National Chemical Laboratory as Scientist’C’ .Mr.Rangnathan was the chief of the division and he saw a creative mind in Dr.Samita and nominated her for Best Scientist Award for her achievements in R&D. Sir, please consider the later one (sumita) above 2 were posted by mistake. Sorry for in convenioence. Shikha a 12th class girl she is clever and confident student and the one who always score top in the class.Shikha has a practical of chemistry today.being a scholar she always do an appreciative work in practicals. but today something goes wrong and faces a difficulty her friend Akash got scared if what she is doing is correct but Shikha is a confident girl and she manages to wort it out and does the practical properly. and again scores well in the same.Her work got a lot of appreciations from the teachers.she take first in the final exams as well.after finishing junior college she takes admission to medical college and become surgen.nowadays she is working in a renowned hospital of country and is a great surgen. RAMA 25 YEARS OLD.SHE WAS WORKING ON PROJECT WHICH WOULD BRING GREAT CHANGES IN MEDICINE.SHE HAD A SORROWFUL EXPERIENCE IN PAST THAT HER FATHER FOUGHT WITH ALGIMERS DIESEASE AND PASSED AWAY.THEN ONLY SHE DECIDED TO SEE THE END OF ALGIMERS.SHE GOT ADMISSION IN A WELL KNOWN UNIVERSITY.SHE STARTED HER RESEARCH WITH MATES.SHE TOOK IT SERIOUSLY AND WORKED ROUND THE CLOCK.ONE OF HER MATES ARAVIND ATTRACTED BY HER DEDICATION TOWARDS THE COMMITMENT.HE HELPED HER THROUGH OUT THE RESEARCH.FINALLY SHE ACHIEVED HER GOAL AND THEY REWARDED.LATER THEY MARRIED AND LED A HAPPY LIFE. Krishna was young doctor who completed his MBBS from Gandhi Hospital, Hyderabad. Due to his interest in new innovations & research in the field of medicine, he used to keep track of all the new innovations along with that due his interest in research field, he started his research on drug for AIDS and had studied many books regarding this and presented his thesis to the international council. Keeping in view of his thesis and research he was selected as one of the members to join with senior scientists who are from different countries involved in this research. And he was appointed as Junior doctor to work with the Sr.Scientist Ms.Laxmi Rai who is also from India. Both of them continued their research, but suddenly the sr.scientist laxmi fell ill and was unable to work. But without losing his confidence, Krishna motivated her and took her guidance and continued the research. And finally a new drug named antiretroviral drug was found which fights against AIDS. And the international council organized a seminar in which both the doctors presented their new innovation. These two doctors from represented Indian with their new innovation and promised to continue their journey in the field of research for the sake of the country. Srujan, a very good story. You will not get so much time to write a long story as this. THANK YOU SIR. I WILL TRY TO IMPROVE FURTHER MORE AND MORE. Priyanka was a biotechnology student very intelligent and courageous.Her mom was died during her childhood day because of Cancer.She decided to find out medicine to cure this disease thats why she joined biotechnology and in her final year with the help of her Professor Mr. Issac she got new formulas for drugs which cures cancer and as the result she got first in project and national award for invention of new drug.She remembered her mother to achieve this. Uma Maheswari, “mom was died”- ‘mom had died’ is the correct way to write it!! small errors in grammar need to be rectified overall average story. Story short. Mood :- male = neutral, female = positive. Shruthi was very intelligent during her childhood days. She wanted to become a scientist. Because of her hard work and dedication she is presently working as a junior under Rajesh. Rajesh is a top scientist in ABC medical labs. One day in her city she saw in the news that the people are suffering from severe sickness on drinking the river water. Shruthi decided to test the water and find out the reason for the situation. As she examined she found out a deadly virus contaminating the river water. Soon Shruthi informed Vikram, Both of them worked hard and found a cure. The Antidote was supplied to the hospitals, which inturn saved the lives of the many infected people. Both Shruthi and Vikram were thanked by the people in a grand function. Reena is a very hardwoking and an honest girl, and her ambition is to join police force and serve the nation. she’s preparing for on going science exhibition. she is working on a chemical to detect finger prints for which she asked for Dr. Geeta’s help. They both came out with the chemical meeting the requirements and their invention won them not only the award but also a great achievement in criminology. Abhishek Kant, a very different aspect to the picture. Good. try to add 2 more lines. ” Do carry a negative of white shirt photo with you at SSB center “.What does it mean actually? Could you please assist me sir? Srijith, it means that you have to carry a negative film of your photograph taken wearing a white shirt!!! Dont tell me that you dont know what is a negative of a film/photograph!! Ashok, a chemical engineering student, had recently started his final year project. .He along with his group of 4 students decide to make a drug that will help on malaria with more effect and costing half the market rate.Ashok divided the task of information gathering,chemical gathering,reactions on body etc.They started googling,reading scientific journals on malaria, and related material.they often approached their chemistry teacher for help.With a long ,and continuous effort of 10 months they finally suceeded and that drug was sent to NCL for testing. their project was one of popular one and they got distinctions in final exams. Thank you sir for making me to understand. Miss Daisy is a student pursuing Post Graduation in Chemistry, carrying out her research work as shown in the picture. Her work, development of 5th generation of Biofuels, is dedicated to make the planet Earth greener. She came across the news of death of her father, which was a setback for her as he was the only bread feeder in the family. She realized as a result that she wanted a glorious legacy in her life. She made use of insurance money well for family, and continued her research despite of several undesirable results in experiments. Finally she invented the keystone of her research. She thus became a legend, an inspiration and she succeeded in her purpose of life. Sheikh Abdullah, your story is good, but it does not relate much to the picture..
was my story too short to present or does it require to be elaborated a bit more?? Prem & Pooja were working on pre-launch schedule of missile at ISRO.They were filling & pressing the hazardous sodium & thermite mix.It was a hot & humid day there.suddenly a drop of sweat from pooja forehead fell onto the sodium.Before they would know what was happening,there was an explosion which shook the room.they were shocked & stunned.The fire was spreading & water would not douse the sodium fire.Trapped in dilemma ,Prem didn`t lose his presence of mind.He broke the glass window with his bare hands & threw pooja out to safety before jumping out himself.Prem called the fire services & helped them to douse the fire without caring his injuries. Mona was a Lecturer of chemistry in Delhi University. Along with teaching she was pursuing her PHD on organic chemistry. After her lectures she works late evening and also took help of fellow colleagues for her research. Regular study and practicals made her complete her thesis. The day the examiner came and checked out the practical of project and was impressed with her performance. She was awarded with PHD degree. Everybody congratulated her and she was very happy to to get her degree. sir you didn`t evaluate my story(97 no.). asif was a final year student of chemical engineering he was given assignment by a company to develop a chemicaldie which can withstand high temperature resistant to acid and corrosion attack asif gathered the requisite information from internet , consulted his proffesor and applied all his knowledge which he gathered of studing he was able to make the die in short time period fiven by company by burning midnight oil on the judgement day die was tested by his proffesor in front of company officials which proved succcessful and later die was used in making many suuccesful instruments. Reena was from a middle class family lived in a town near ernakulam. Her father was a school teacher. During her studies she was much interested in chemistry subject. In the school level she represented many science exhibition with her families support. She did here graduation in Biotechnology and emoloyed in DRDO. As keen to interset in Chemical activities. There was a flu that killed many people orginated from bird. She took many samples from of the dead bodies and worked and worked on day and night with her fellow mate Jhansi in the labaratory. Inspite after looking the home and family. She came bhack to the labaratory and started working on the flue with the help of her friend as it drastic issue. She collected samples and working oin it she could develop an anti-body that would kill the Flu without side effects. She was happy that she did it with the help of her wel wishers and her seniors praised for her work. thanx sir,it is your guidance`s effect. thanks sir i will take care of points told by you. vanshika was academically sound and intellegent since her childhood days. she cracked comptetion and completed graduation in chemical engineering. After completing her graduation she decided to take the Phd in the same field and do research simultaneously.she had an idea of making such chemical which when mixed with petrol limits emission of carbon-di-oxide and other harmful substances to nature.To accomplish her vision he took help from professors, internet, did lot of studies, examined previous research papers for analysis and applied all her knowledge. Due to his determined hard efforts , after several attempts she could succeed in making desired chemical . she submitted it to automobiles agency for testing and it bore positive results, the chemical acted as purifier. Finally she thanked professors for their support and felt convinced with sense of achievement..
KULDEEP, good story!!! You need to take care to avoid using her/him,he/she for the same person at different time !!! Dr Bala and his wife after finishing their PHD in AIIMS Delhi, both were working as senior researcher at London School of Medical Science.This couple have been doing research for inventing the drugs for cancer for last 7 years,despite of so many failures they never give up their effort or endeavor in their experiments.Despite of enjoying their family life so many times they have spent their nights in the Medicine labs on experimenting on different procedures.At last their endeavor becomes fruitful and dream comes true after continuous effort of 7.2 years the couples invented the drugs which can cure vicious disease like cancer.It has opened up a new chapter of success in the world of medical science and brought glory for the couple as well as our nation india. Dear Sarangi, You are they working in the London!!! Dont you like them to work in India??? Yes,Sir i ll check that from next time.Could you please comment the standard of the story,hence i can focus on that.Thank you so much. sarita was doing her phd in pharma when she decided ti work upon the vaccine for AIDS,because it is the biggest health threat to india and also she decided to do somthing about the dejected lives of AIDS patients. She met her guide and seek her support, she took permission for using lab during off working hours, she took help from her friends in the researh work. She reffered many medical journels and papers, she met many doctors dealing with the AIDS patients. She met AIDS patients and observed the changes in their immune system regularly. She started working on various leads and got intial succuss after few setbacks. She experimented on animals and found her experiments in a good direction by the guidance of her guide and other seniors. She took permission for tests on volunteer human beings and invited them. She got good response and started her trails under strict supervision. She got success in inventing the vaccine of AIDS which would serve the mankind. She and all her friends were happy to serve for AIDS Patients. Sita was a pursuing hes graduation in pharmacy. Once she had to work on the vaccine for the cure of disease spreading rapidly in the city. She raad the survey report of the patients suffered from the diseases and note the symptoms, consult the doctors about the danger and speed of spreading of the diseases and she also asked the doctors whether it is a communicable diseases or not. She then went through all her study materials, books, related magazines. She also took the help of the reference books available in the library related to the topics and read the related articles on the internet. She consulted her teachers and friends. She worked day and night and with her hard work and team effort she got the success in preparing a medicine for the diseases and saved the life of the suffered people. She felt very satisfied on her hard work and achievement. I made some typo mistakes as my typing is not too god but tell me the idea, theme and outcome of my story. Tell me the errors need to improve and lacking points as well. Sunil was 23 yrs old Msc[botany] youngman. one day while visiting his hometown he saw the crop was suffering from some disease because it was having some brown spots.He took the sample and tested it with his assistant. He found that the crop was suffering from bleet root disease which can be easily cured with help of pesticide, so he start making farmers aware about the use of pesticide and also told about the proper irrigation requirement. After putting these efforts farmers got the huge production 3 month later. Sunil got the appreciation from block development officer. Rahul concept is good. Story is good. But your writing skills needs a lot of improvement!!!! Lot of silly errors in writing. Overall good. 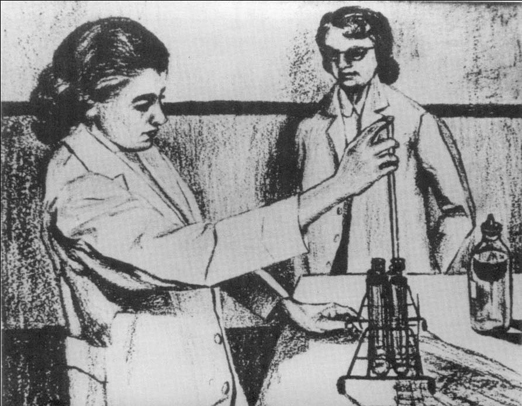 In this picture,the scientist madam Currie is researching on radioactivitity with her husbsnd for which later she was awarded by nobel prize.She is doing an experiment with kripton crystal for photonic radiation.She got an excellent reseach which is observed by both madam Currie and her husband.Madam Currie dropped the drops of inorganic solution to react with kripton 86.Kripton 86 crystal started showing the change in the shape of crystal which is keenly observed by her and her husband. amir, a scientist in national research institute was assigned the task to carry out the research on hiv virus.. he selected a team of scientists.. prepared a rough plan.. briefed his team about it.. now he divided his team into two parts.. one collected the data from the published researches results and other met with hiv affected people.. now all sat together.. amir analysed the data and along with others prepared the list of various lab tests to be carried out.. noted down the results. now he prepared the final report and submitted it.. he was very happy with his team work and carried out various results in future also. Dear Hitesh, I might have missed your story due my mistake. Will review it afresh if you can post it again. The story is good , but somewhat I feel it is incomplete. If HIV was to be cured so easily then by now there must be no HIV. The logical reasoning to solve an issue is not applied here. Needs further refinement and improvement. Thanks for comment sir, how will u rate the story if research of malaria virus is carried out inspite of hiv virus..
Hitesh Khajuria, yes it would have been a lot better!!!! Rekha was a doctor and was also associated with an NGO, one day her NGO made a medical checkup camp in a village..The villagers came there for their checkup, what Rekha noticed that most of the villagers were suffering with same kind of problem, she took the blood samples of the villagers and examined them with the help of her seniors and came to know there was endemic.. She with the help of her NGO arranged medicines for the villagers, with her efforts the situation came under control after some days.. She was thatnked by all..
Abhishek, a good story. Though the examination of the blood samples part is very small , still it is good!!! arun a 22 yr bsc final year student with chemistry as her specialization was vary much keen in organic chemistry she wanted to do research on organic reactions among compounds . her keen interest made her to approach her chemistry professor mr kumar .he help her with the required research she started spending extra time in chemistry lab she refered previous literature reviews related to her topic she also approached to the chemistry department for the required materials related to the research . she was helped by the department . finally after spending 5 months of keen efforts she completed her research which was been appreciated by department of science & chemistry. her research got patented in her contribution towards science..
meera was a bright and dedicated student . she was very interested in chemistry. she wanted to do b.tech in chemical engineering. she studied a lot and gave the iit exam. she cleared the exam and was the topper in her state. she worked even harder now and got a fascinating job. she started spending hours in the lab and one day she discovered a very efficient, low polluting fuel… she called her head and she was later awarded the noble prize in chemistry..
Ramesh, is one of the senior proffessor in BMS engg college. He is a strict proffessor of the college. Sometimes he became rude on students. Students of him found very difficult to ask doubts/clarifications regarding subject as they felt that he may scold us. In his students, he found Suma as a dedicated girl in her studies and he used to follow her in school hours to get her study pattern. One day he found her in chemistry lab working on some new reactions. He asked her about that chemical procedure she was doing. As she never felt difficult with Proffessor’s strictness, she answered calmly that she was doing some experiments on polluted river water in her locality. She further told that she is planning to remove all chemicals dumbed by factories by using her new chemical. He felt very proud and blessed her for her new invention. Nextday, she told her interaction happened yesterday with Proffessor to her classmates and she also told that she was blessed by him. Hearing this, all students found that they were mistaken on Proffessor behaviour and after they started interacting with him. Proffessor come to know his mistakes about students that he was rude. At the end, Proffessor become the best teacher of the college. Radhika had insatiable love for chemistry ever since her dad introduced her to chemistry.So she did a PhD in inorganic chemistry.She was a native of calcutta the most polluted state of India.There was LEAD(PB) in evrything water,air,soil resulting into mentally challenged kids,nausea,brain related diseases.She thought of making some contribution in this field by assisting her dad who was a renowned scientist and currently doing research in neutralizing the effect of SO2.Her dad was very much impressed by her zeal,intrest and moreover her intension of doing some welfare of the society.Both worked day and night and their diligent and laborious attempts resulted into a chemical fluid that if added to water can tranquilize the effect of Lead thereby saving so many people from the lethal disease. Ashok and her friend gita 21yrs young dynamic student of gandhi pharmacy college belongs to AP.after completed his study both got a job in nilachal pharmacy pvt.ltd.in his company his boss told him that to discovered a medicine that cure the dibetics.both satarted hard working day and night after one year he discovered that medicine and hand over into his boss.After successfully completion of test next time then it sent into the market for production.the boss gave both of them into upper level post of his hard working …..
Sheila, a young, talented and dynamic student of 12th class wanted to be a chemical engineer in her life. She told her burning desire to his chemistry teacher. He was very happy by hearing her. He guided her and told the important books she must go through. She discussed with nearby friends and took their advice in preparing for entrance. She joined most reputed college of her area. She passed b.tech with 1st division in chemical engineering. She became a great chemical engineer and joined DRDO to serve her country. astha is a college student was appering M.SC from govt.model science college.it is going her practical examination.she got her question and stared doing practical.Initially she was so confuse but she tried to pay her attention in practical test.her teacher also guided her and she could complete it well ,got full marks.she became a chemistry professior.and joind DRDO as an office to serve country. sweta was a B.Sc. agriculture student from singhania university jaipur.there she got to know that her father had a large size of agricultural farm,but still the yield was not good cosequently there financial condition was also not good. she discussed this with her father and then got the soil test of there farm done from there collage. it was found that there was deficiency of many required minerals in the soil. she discussed this with her proffesers and asked for the suitable majore to be taken. with their advice she added gypsum,urea and many other required minerals to the soil. on the next monsoon his father grew cereal crops like jwar and mung on their field and this time the crop gave the positive results and yield was good which consequently improved their financial condition. Rishu ,a medical student pursuing ph.d. once her friend was performing an experiment in the lab, our lecturer suddenly came to her to have a look at her way of handling the appartus. because mam was continuously observing her ,she got nervous in her presence and was about to slip the test tube then rishu came to her and helped her.this reminded her the days of the final examinations .the same happened with her.but now due to guidence of her teachers ,now she is working on the ways to cure cancer with group members. RATAN and sunaya both have passed their graduation from the same university. after getting graduated from the university both are doing the research work in the same company. They are working on the research to find a vaccine for the treatment of bird flu. Both with their hard work and cooperation got success in finding a vaccine for the treatment of birdflu and are much appreciated by everyone. Hammad is Chemical Engineer in a urea factory in Agra. Recently he vijited Taj mahal and found that its colour is becoming yellowish due to pollute gases coming out from urea factory. He decided to make some chemical tests to make urea production free of polutants. So he made a team of specialised chemist. Different reactions were done and finally he succeeded in making polutants free urea. He thanked every member of team for their support. sonia is a student of 12th science in kendriya vvidyalaya and this was the time of chemistry practical before practlical she practice for practlical very much and now was the time to out perform his roll no was 12 and he was called for practicals by his chemisrty teacher abdul wahab she was quite confident that she would do nice and get good marks his teacher said that to perform the practical of inorganic salt she became happy because she knew it well and performed well and before the day of result his teacher called sonia and congratulated him for getting 1oo marks in his practrical . rashmi ,a school girl and had a very keen intrest to do higher studies in chemistry from delhi universityso she started prepration for it.initially she was getting some problems so she took help from internet,gone through different books and main inportant things she improved her accuracy and pratioce several previous years papers and finally her sincere efforts came true thats why now she is teaching in delhi university. rani, a chemical engineer of CIT was preparaing a new compound to remove impurity from polluted and contaminated water. she along with her senior ramesh were working on this project for last 7 years . after a hard work of 7 years it seems to them that they were going to do something done for their country . they both had dreamt from childhood to do something for their country and now by inventing this compound they can cure lakhs of people suffering from water borne diseases. it could be a revolution in chemistry field and also others nation can be helped as pollution is a threat to every nation.by inventing this they will not only help thier country citizens but also encourage and motivate young generation to do something for their country..
Reema belongs to a remote village and she completed her B.Tech in chemical engineering from IIT Delhi and went for R&D Department.She noticed that farming in her village yeilds low.So she decided to make her own fertilizer in her laboratory and went on making chemicals for farmers. After working for 3 days she created a sample and tested in her own farm which resulted in high yeild.After that she began to supply new fertilizer in her own village and soon after she gained recognition from government for creating new fertilizer and thereafter this fertilizer is supplied throughout the country by the government and helped poor farmers to yeild high. Saraswati a girl with full with an ambition to become a great researcher in the field of medicine was my student at ahmedabad university. In this picture she was performing a test to prepare a cure for cancer.While looking on to her ambition to become i felt proud to have such a student full of ambition in her life that sometimes i also got inspired from her thoughts as such then.When i was looking towards her at the time when she was performing her experiment on the cancer cure i felt proud to have such a brilliant student in my batch whose ideas were much bigger than her age.Looking to her work and an ambitious idea it she made me proud and gave an everlasting smile on my face as portrayed. sir,i need your suggestion to crack ssb interview,i go through most of the comment on the stories of ssb aspirants and those comments also applicable to me.with your guide line i will prepare for interview ,, good noon sir. Rohit and Malavika were friends from childhood. The lived in the same colony and were from middle class families. From childhood itself they had this dream of becoming great doctors.Despite of the financial constraints of their families they struggled hard and got admission to Trivandrum medical college and passed out from there. In the meantime they fell in love with each other and got married with their parents’ consent. Further they went on to pursue their masters and PHD in nuclear oncology and became reputed nuclear oncologists. One year back they received an offer from the Indian govt to join a research program to find a cure for cancer. At the same time they got an offer from a US based pharmaceutical company too, with a very luring package. But they accepted the Indian govt’s offer and right now after one year they have successfully completed the final stage of their research and have found the cure for cancer. They present a request before the Indian govt that the availability of this new cure shouldn’t be restricted only to India and this should be made available to the whole world. The govt of India agreed to it and right now they are planning for the world tour sponsored by the govt to create awareness about this new cure to the world. ###Sir Please rate this story. rohan was a very brilliant student in academics since childhood. he was having a keen interest for chemistry. he liked the reactions that took place among various elemnts and compounds to form new products. his aim was to form a new medicine for AIDS which should be cheap and effective as well. during his universtiy days his chemistry professor Dr. joshi found his hidden talent and vast knowlwedge aboput various chemicals so he assisted his in the experimentatation prcoess in the preapration of new medicine for AIDS. it took a complete two years for them to invent the new medicine. now this medicine is available in market and AIDS is now not known as a diseses which cant be cured. so in this way rohan and his professor become the world known personalities and they also shared the noble prize for medicine that year.